These are a favorite drink in Costa Rica and other Latin American countries. They are also known as Batidos in the Caribbean or Licuados in Mexico the names varying regionally. They are made with fruit, sugar, milk, ice and are similar to a milk shake. Our recipes use Silk Almond Milk and Truvia no-calorie natural sweetener. This makes these very low calorie with no diary products. Frescas can be made using almost any fruit or berries. Mango, papaya, banana, pineapple, peaches, strawberries, blue berries, watermelon or mixed fruit. There are two types of fresca, Agua and Leche (water and milk). The following are for the milk versions using Silk Almond Milk. Fruit - One mango peeled and seed removed OR 3 or 4 Pineapple slices. Sugar - One or two packets (about 1 or 2 teaspoons) Truvia (Stevia extract) to taste. Put ingredients in blender and blend until smooth. Serve in parfait glasses. Makes two full glasses of about 150 calories each. This is a low calorie natural desert drink. As a desert it is not super nutritious but it is not unhealthy. The calories are 1/3 of many fruit shakes and 1/10 or less than those made with ice cream. Frescas made with straw berries and blueberries will be high in antioxidants and vitamins. Note that traditionally Piña Frescas are not made with milk. They are Piña Fresca con Agua only. However, using Silk Almond Milk works with pineapple where regular milk does not. To increase the nutrition in a smmothie type drink use berries more than fruit as these are typically higher in antioxidants and vitamins. If fresh berries are not available frozen will do. We also use dried Goji berries as an addition in all kinds of things. They rapidly rehydrate in water or fruit juice. Use vegetables such as carrots and kale to supercharge the nutrition in a smoothie. Nuts can also be added for flavor, Omega-3 fat, and blend to an unnoticable powder. Experiment, it is easy and rarely goes wrong. Pineapples take a year to 18 months to grow and only a few days from picking in Central America to the grocery counter in the U.S. The perfect pineapple is mostly green with just a trace of yellow starting to show as in the photo. 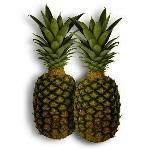 A "too green" pineapple is difficult to find but should be ripe enough in a day or less. 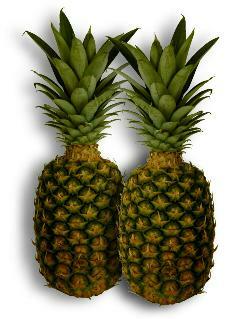 Pineapples that are yellow or mostly yellow are overripe. NOTE: We have found that other brands of Almond milk are much sweeter (too sweet to our taste). Blue Diamond (a great brand of Almonds) has twice the sugar as Silk Almond Milk. If you use other brands for frescas you may want to reduce the added sweetener. Christmas Bread guru's original recipe.